Vietnam may be the next China. With a nominally communist government, Vietnam has liberalized its markets and is prospering from an increased reliance on exports. Vietnam's gross domestic product per capita is still only about $3000, but has been among the faster growing economies over the past 10 years. Vietnam is well positioned to capture any growth that might be diverted from China’s east coast urban areas as labor costs there rise and concerns increase about the influence of that country’s powerful state-owned corporations. Political power in Vietnam may lie in Hanoi, but the economic heart of Vietnam is Ho Chi Minh City, the former Saigon. Ho Chi Minh City is the core of Viet Nam's largest urban area, which is headed toward a population of 9 million, including exurban areas beyond the municipal boundaries. For planning purposes, the area has been divided into five subregions. 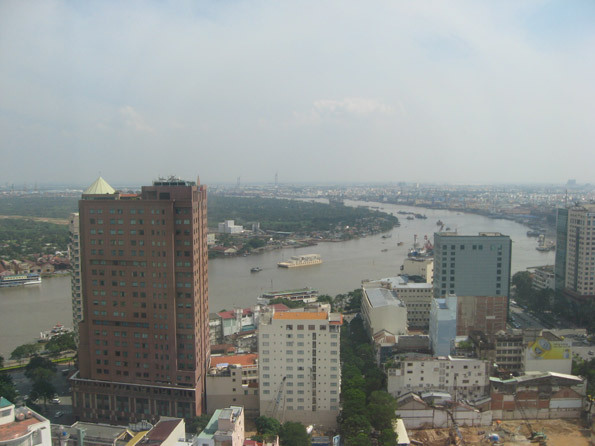 The urban development trends in the Ho Chi Minh City area are similar to those of high income world urban areas. The core is experiencing little or no population growth, while peripheral areas are growing much more strongly (Photo: Core and Saigon River). 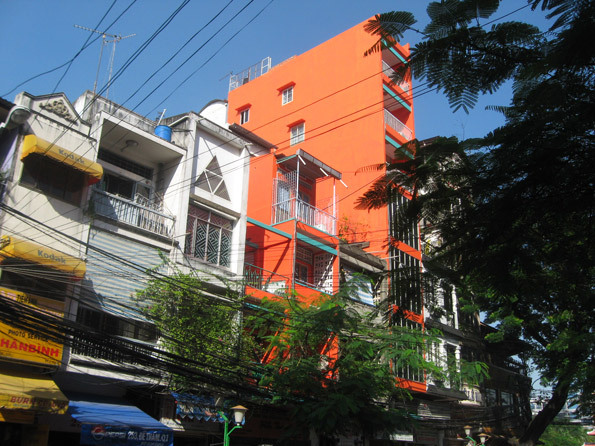 Suburbanizing Ho Chi Minh City: Historical data for the districts of Ho Chi Minh City are difficult to obtain. However, the last five years provide a representative view of urban development trends, especially when combined with population projections through 2025 as reported in transportation planning documentation from the Ho Chi Minh City master plan. Growth is stronger, but still limited in the outer core area (adjacent to the core, but differentiated because of its lower density). Over the past five years, the outer core grew from approximately 2.2 million to 2.5 million, which is strong growth in most high income world urban areas but not as notable for a rapidly growing urban area in the developing world. This growth is expected to moderate even further by 2025, when the population is expected to reach only 2.6 million. The population density in the outer core area is 60,000 per square mile or 23,000 per square kilometer. 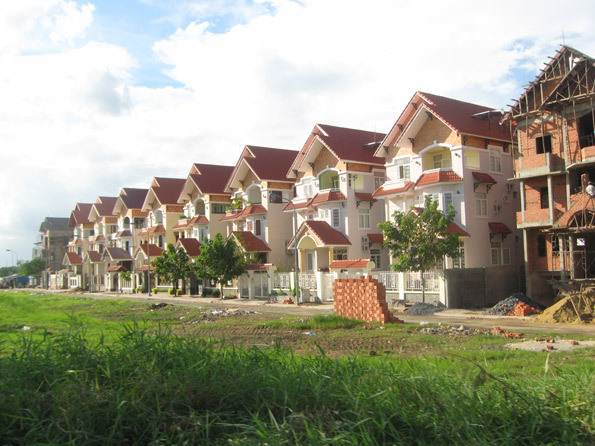 In contrast, almost all the growth is expected outside the core, with both less formal development and very attractive housing (Photo: New suburban housing). The urban fringe areas, or the second ring of development beyond the inner core grew from 1.5 million in 2004 to 2.0 million in 2009, a 31% growth rate. By 2025, the urban fringe is projected in transportation planning documentation to grow to 3.0 million. The population density of the urban fringe is 14,500 per square mile or 5,500 per square kilometer, nearly as dense as the city (municipality) of San Francisco. 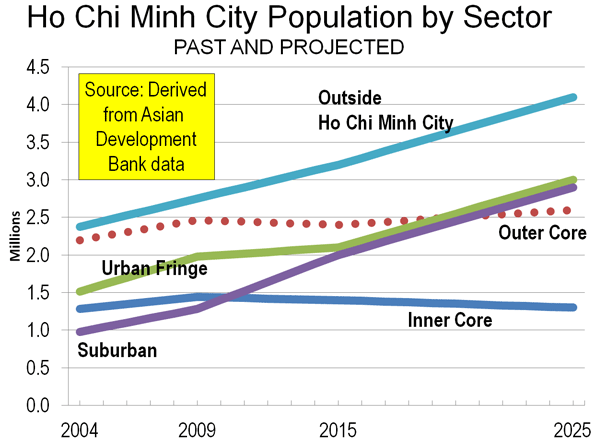 The suburban areas within the municipality of Ho Chi Minh City grew from 1.0 million in 2004 to 1.3 million in 2009, again approximately a 30% growth rate. By 2025, the suburban areas are expected to experience the greatest growth, adding 1.6 million population, rising to 2.9 million residents. Comparable data for the exurban areas outside the Ho Chi Minh City municipality are not as readily available. However, it is projected that from 2007 to 2025 the population in these areas will rise from 2.6 million to 4.1 million. Overall, the municipality grew from 6.1 million population in 2004 7.2 million in 2009, for an 18% growth rate. Including the municipality and the exurbs, it is expected that there will be an increase from 9.1 million population in 2007 to 13.9 million in 2025. At least 95% of this growth is expected to be outside two core areas (Figure 1). Employment growth is also projected to be dominated by areas outside the two core areas. Between 2007 and 2025, it is expected that 80% of the new employment will be in peripheral areas. Building a Metro: Ho Chi Minh City may have the highest personal transportation market share outside North America. The personal vehicle (motorcycle and car) share of travel is 92%, leaving just 8% for transit (one estimate indicates an even lower 5%). Most of this travel by motorcycle, which sometimes carry three or more people. 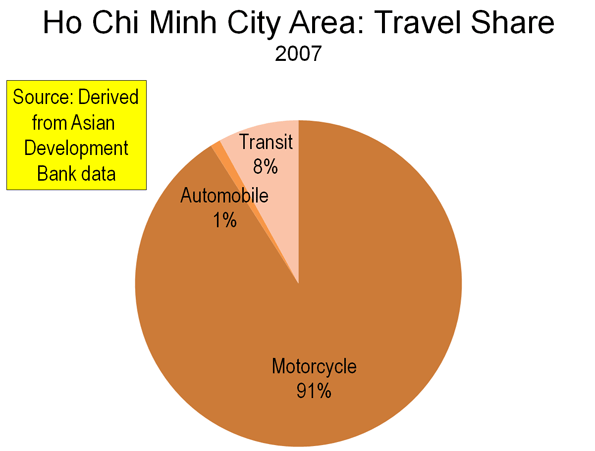 As Ho Chi Minh City becomes more prosperous, the share of travel by automobile will likely increase. Automobile ownership is rising at 20 percent annually, more than twice the rate for motorcycle ownership. The government would like to change this pattern and has embarked on building a Metro in hopes of increasing transit's market share to between 40% and 50% by 2025. This huge capital investment will be largely limited to feed and serve the core areas that will account for virtually none of the population increase and little of the new employment. As noted earlier, the above demand models were adjusted to reflect the Government “policy” objective of achieving 40-50% PT mode share by 2025. This will entail a massive shift in travel behaviour and introduction of some very strong transport and policy initiatives. Clearly there is a risk that this may not happen as quickly or to the extent targeted. Therefore forecasts were developed for a “trend” scenario – still based on major PT transport improvements and strong policy initiatives, but with parameter values based on the consultants’ experience of what has been achieved in other cities. However, virtually tripling transit's market share to 22% seems little less doubtful than increasing it to 40% to 50%. The consultant provided no examples to indicate that such an increase had "been achieved in other cities." 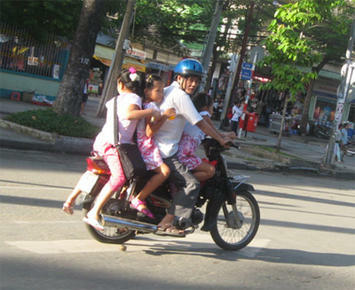 Personal Mobility in Ho Chi Minh City: One of the challenges for a pedestrians in Ho Chi Minh City – like Hanoi – is dodging the swarm of motorcycles in crossing streets. Even with the Metro, more and more will buy motorcycles and cars. Traffic congestion is likely to worsen. This is principally because, even in congested urban areas, door to door travel tends to be more rapid by personal modes than by transit. Fortunately, the authorities are allowing the urbanization to expand, which will limit the growth of traffic congestion. They would do well to follow the advice of urban planners like Shlomo Angel (of New York University and Princeton University), who recommends building a grid of arterials streets to accommodate the growth on lower cost peripheral lands. Strategies such as these provide Ho Chi Minh City the potential to suburbanize gracefully, maintain its high level of personal mobility and contribute substantially to its continued economic progress. Submitted by ymouel on Mon, 05/25/2015 - 00:15. Submitted by aamir_m on Thu, 05/07/2015 - 06:59. Submitted by siya23 on Mon, 05/25/2015 - 07:36. Submitted by wzteja1122 on Sat, 01/17/2015 - 04:45. Submitted by siya23 on Mon, 05/25/2015 - 07:37. Submitted by siya23 on Wed, 04/15/2015 - 03:20. Great Southern Coins is the premiere silver maple leaf coins dealer. Shop with confidence and assurance that all silver and gold coins are backed with a US guarantee shipped direct to your door quickly. Visit them online to add to your collection or start one today. Submitted by Alloss on Wed, 03/18/2015 - 10:48. Submitted by davidalan1122 on Mon, 09/22/2014 - 06:01. Submitted by jagoseo on Wed, 09/17/2014 - 22:00. Submitted by uofix on Mon, 09/15/2014 - 05:26.